Pattern Organization on the Go! ~ Diane's Vintage Zest! Pattern Organization on the Go! A while ago, Tasia from Sewaholic suggested how to estimate fabric for when you are unsure how much yardage you would need for a project without your pattern envelope. I keep my patterns organized at home, like I mentioned here, but it doesn't help me when I'm on the go. 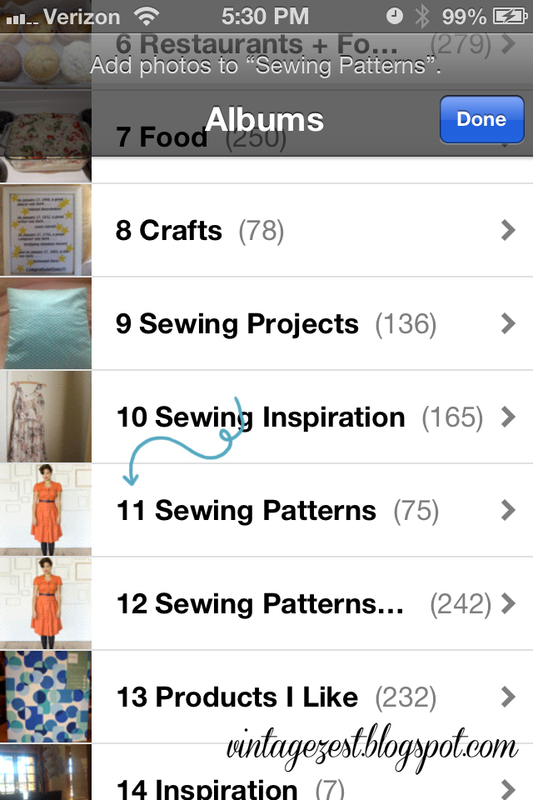 I suggested the way that I organize my own patterns and envelope information on my phone. Not only do you have access to exact yardage, you have the notions that you'll need at your fingertips! Here is a tutorial on my digital organization system! 1. 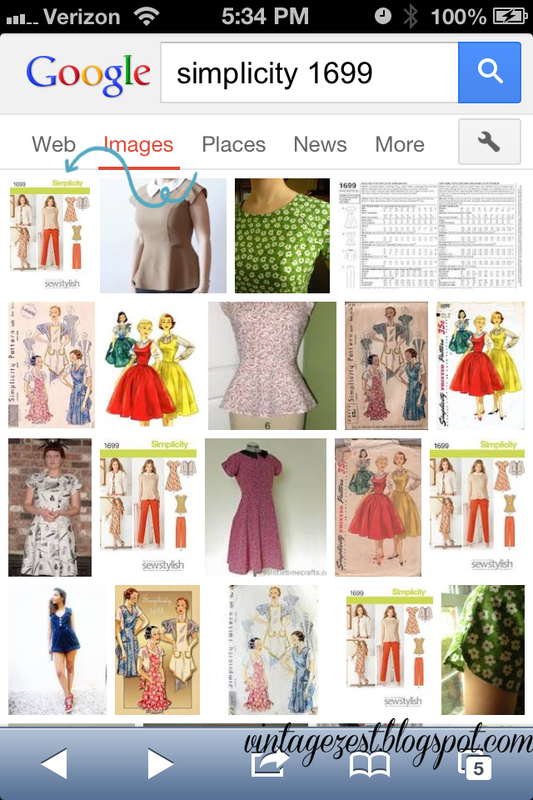 Search images for your pattern and number. 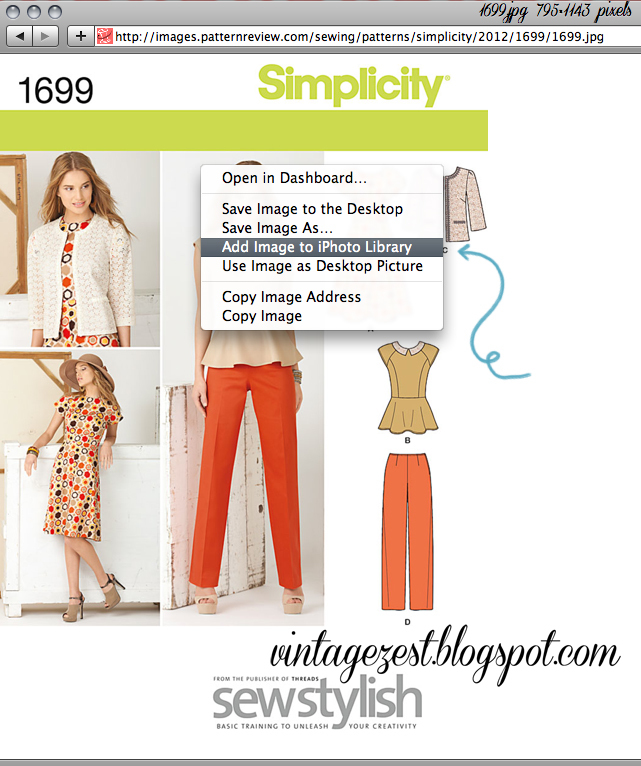 Mine is Simplicity 1699. Alternatively, you could snap a picture or scan your envelope, but I like these high quality scans better. 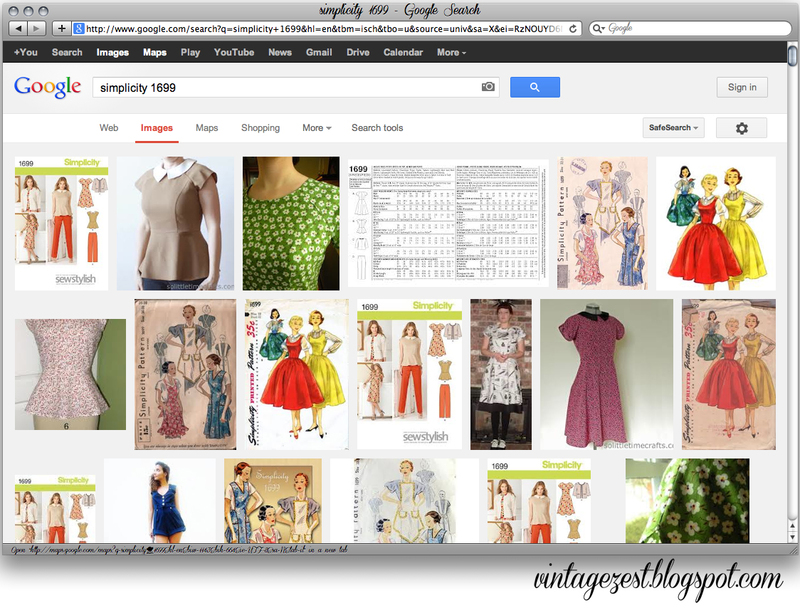 You may have to take a picture for rare, vintage patterns. 2. 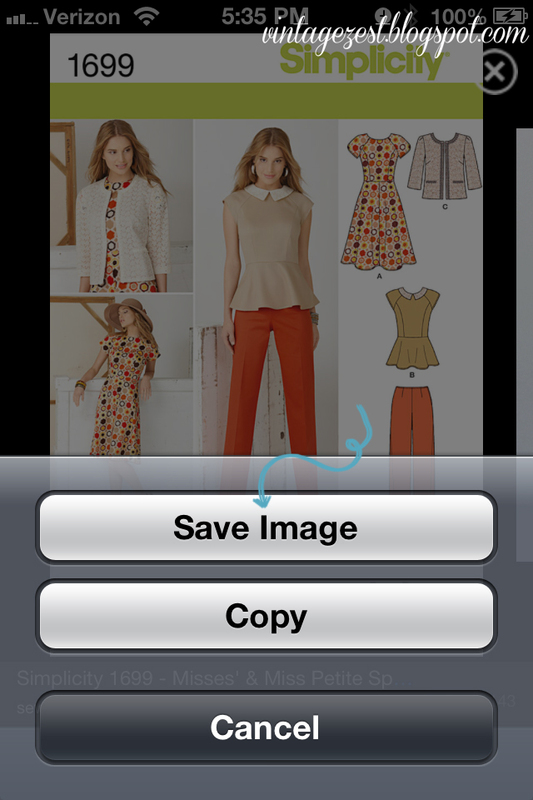 If not using iPhoto, right click and either "Save as Image As..." and save in a folder called "Sewing Patterns" or something similar. 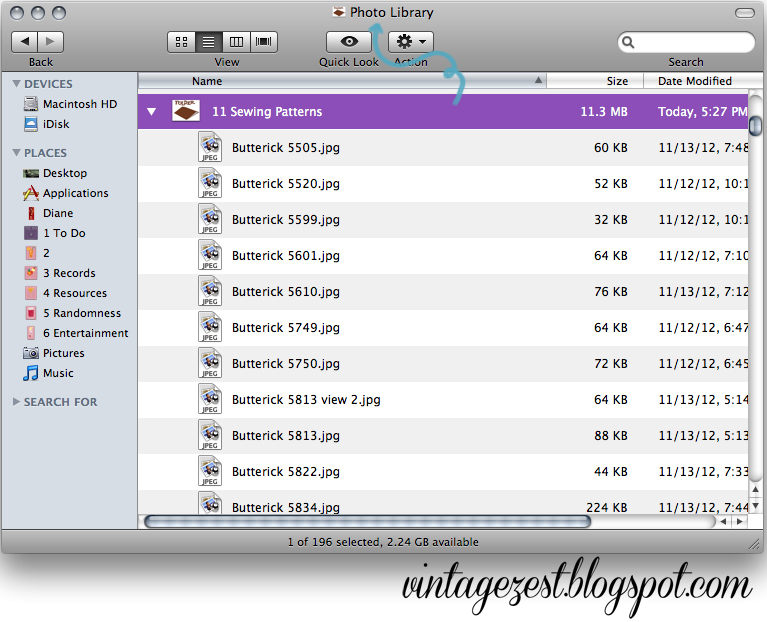 If using iPhoto, "Add Image to iPhoto Library" in a folder, which you can name "Sewing Patterns" or something similar. 3. 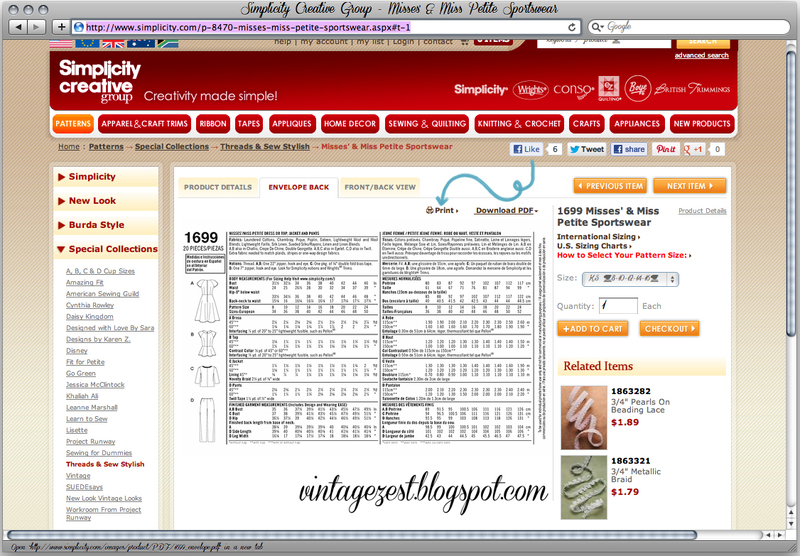 Next, find the envelope back information by going to the pattern company's website and typing in your pattern number. 4. When you find the envelope back information, hit Print. This will bring up a large JPG that you can save. Alternatively, take a picture of your envelope back. 5. 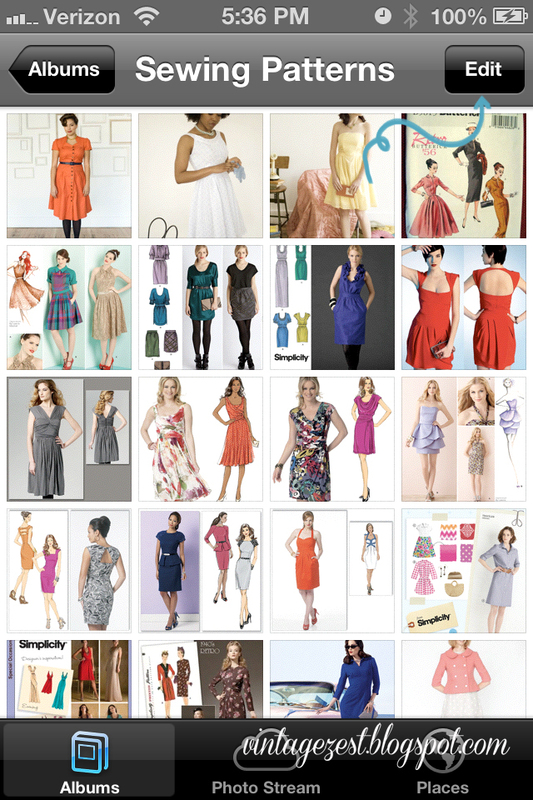 Save the image in analbum called "Sewing Patterns & Instructions" or something similar by right clicking, like above. Alternatively, take a picture of your envelope back. 6.When you find the Front/Back view information, hit Print. This will bring up a large JPG that you can save. 7. 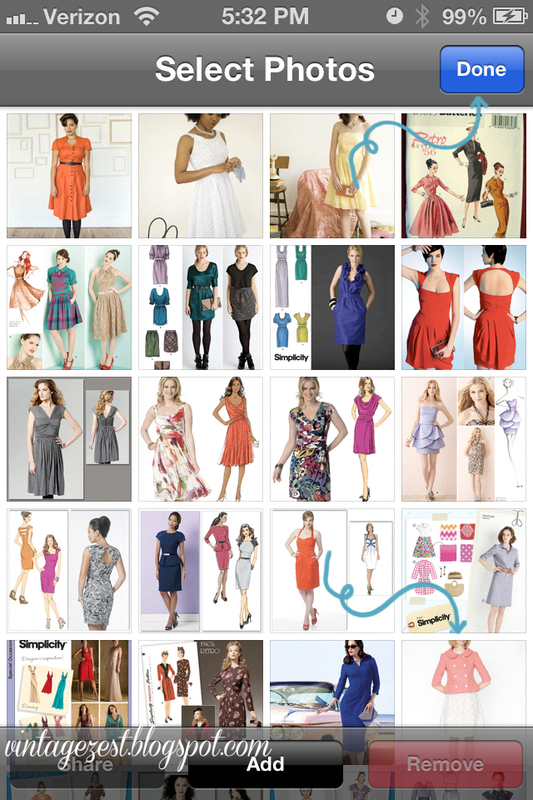 Save the image in analbum called "Sewing Patterns + Info" or something similar by right clicking, like above. If NOT using iPhoto, refer to the next 3 pictures. If not, skip down to Step 8. 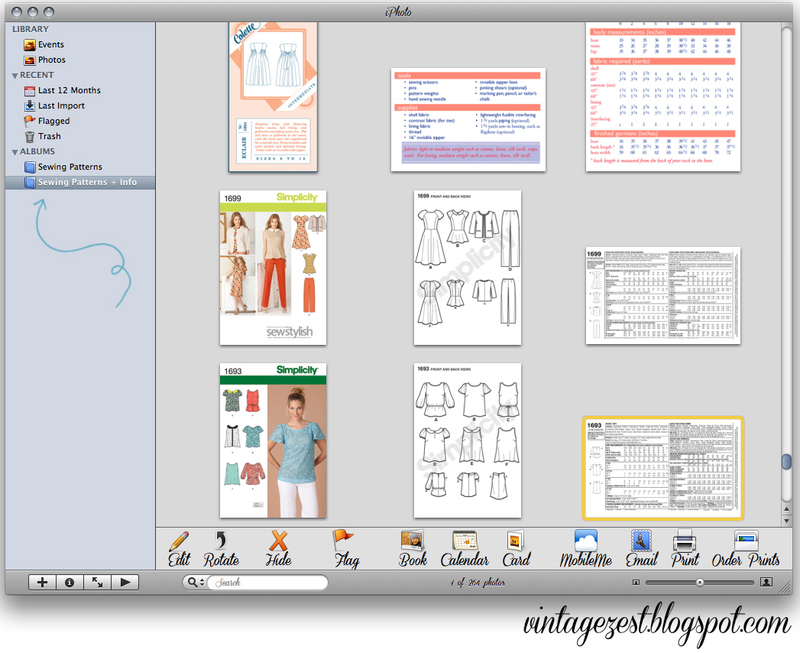 - Here's a view of my Sewing Pattern folder with its contents. Make note of the parent folder where you are adding your two new folders. Mine is called a generic "Photo Library." 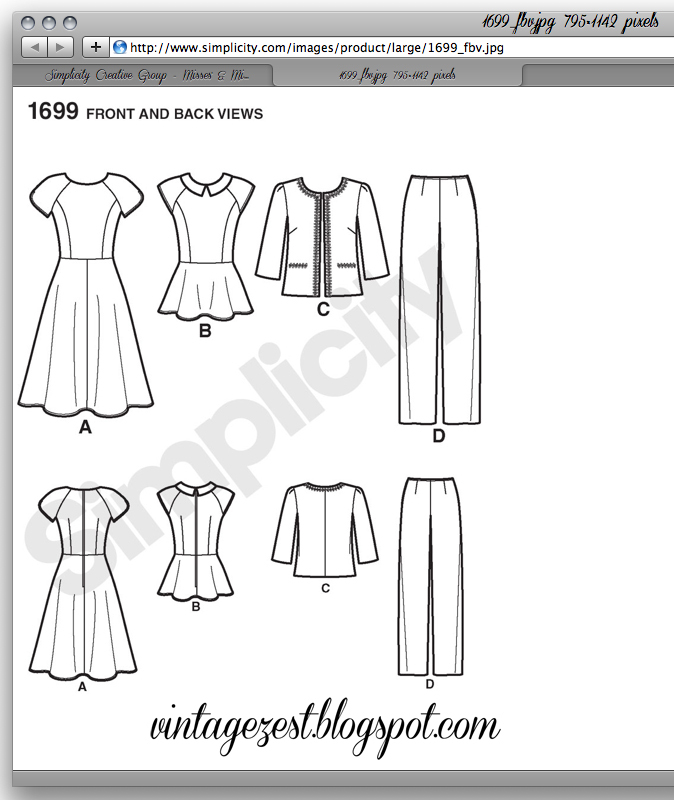 - Here's a view of my Sewing Pattern folder with the pattern I just added. 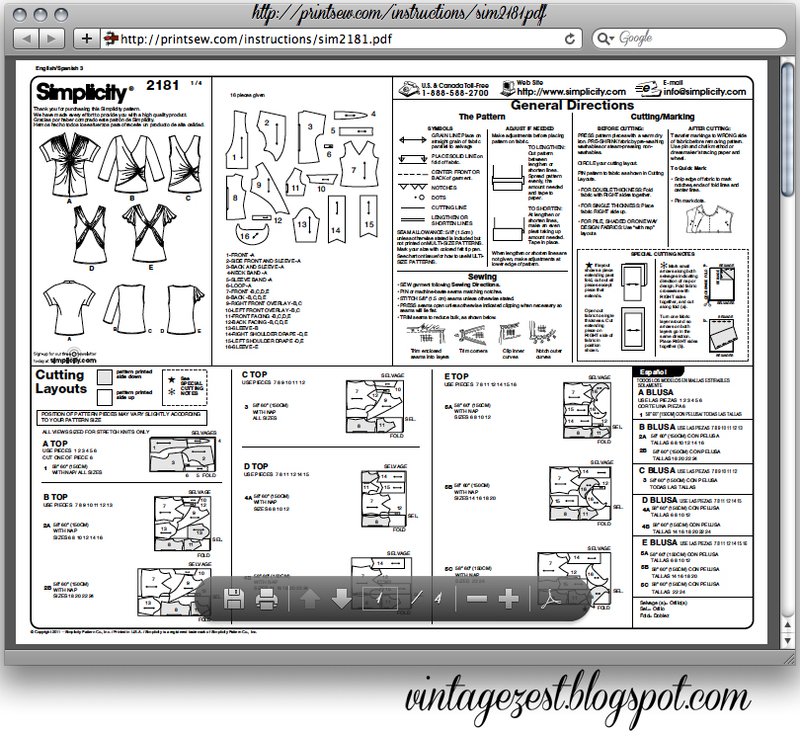 - Here's a view of my Sewing Pattern + Info folder with its contents also in "Photo Library." If using iPhoto, refer to the next 2 pictures. If not, skip to the Step 8. 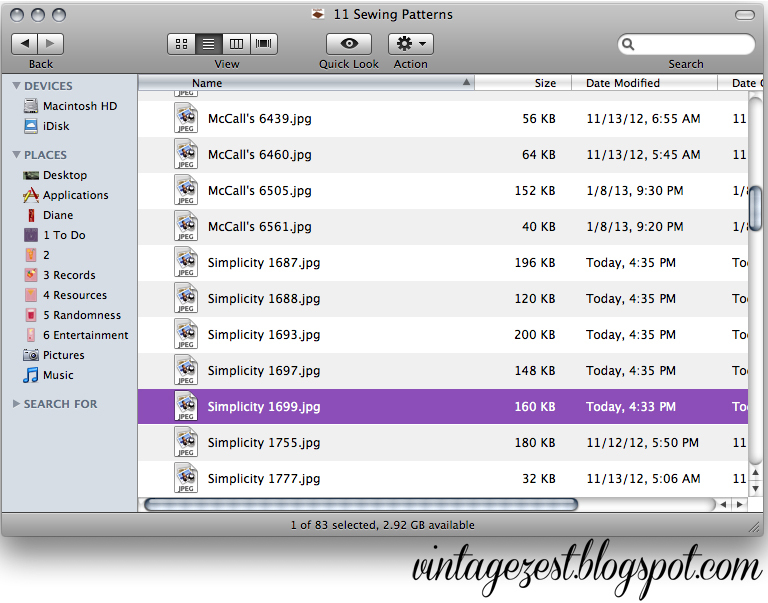 - Here's a view of my Sewing Pattern folder with my patterns. 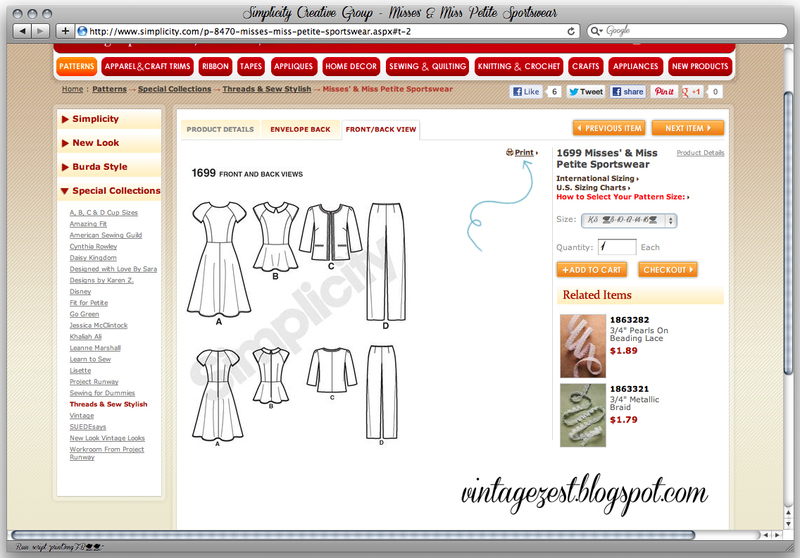 - Here's a view of my Sewing Pattern + Info folder with the pattern I just added. 8. 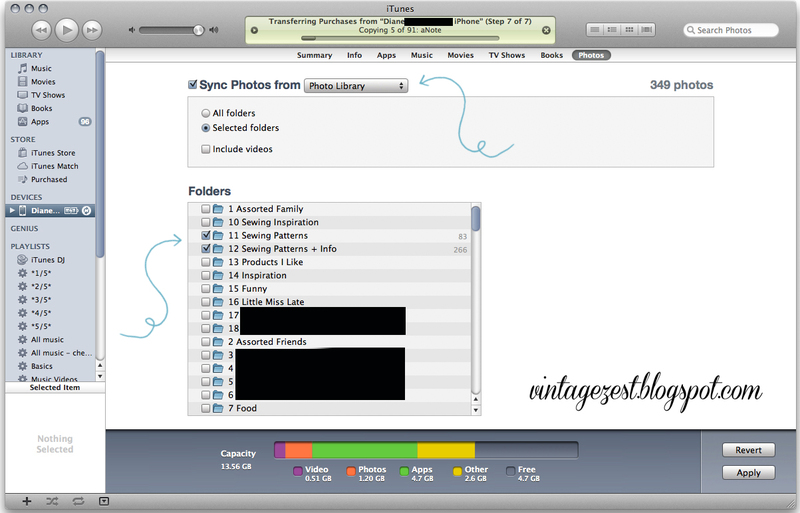 If not using iPhoto, use iTunes to sync your albums to your phone. I selected the parent folder "Photo Library," which I mentioned above, and checked the boxes of the albums I wanted to sync: Sewing Patterns and Sewing Patterns + Info. 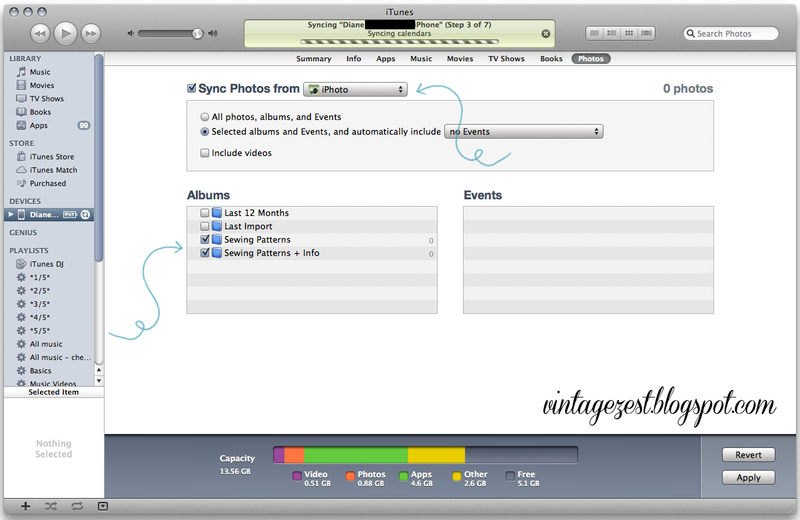 If using iPhoto, select the option of syncing your photos from iPhoto. Check the boxes of your two new albums. Now you have your two new albums on your phone! You could stop there, or continue to make this even more organized! 9. Hit the + sign to add a new album. 10. Enter the new name for the album. 11. When the phone prompts you to add photos, choose the album you just synced from your computer. 12. You can either Select All Photos or click on individual photos. I just add them all. 15. To the bottom. Hit done after you are done rearranging the patterns. Do the same thing for the other folder, and you're done! 1. 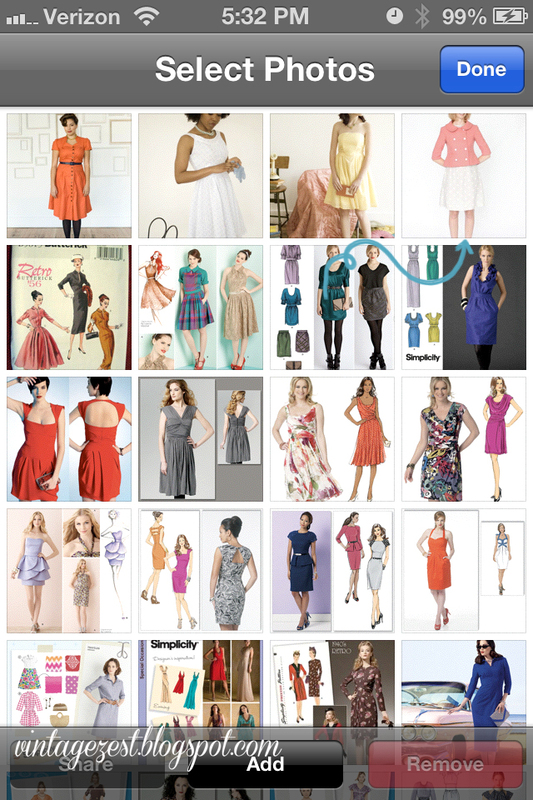 Search images for your pattern and number. 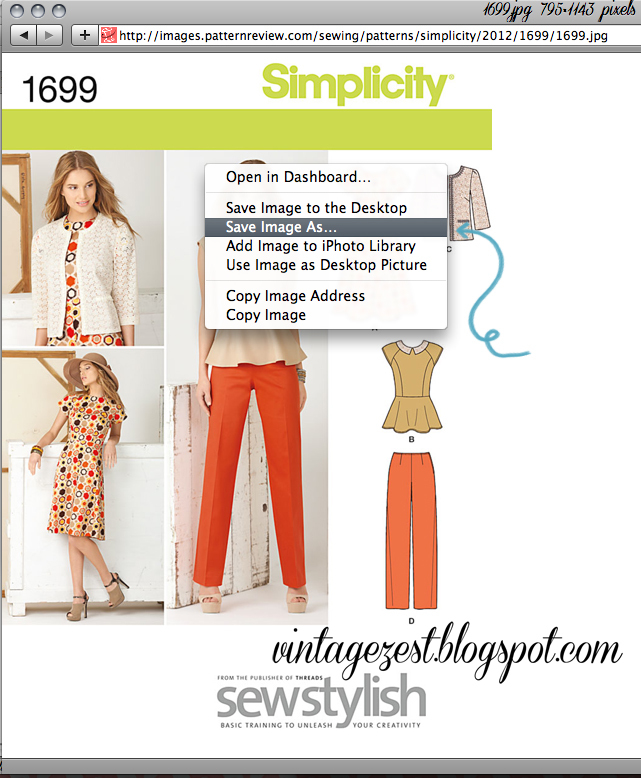 Mine is Simplicity 1699. Alternatively, you could snap a picture, but I like these high quality scans better. 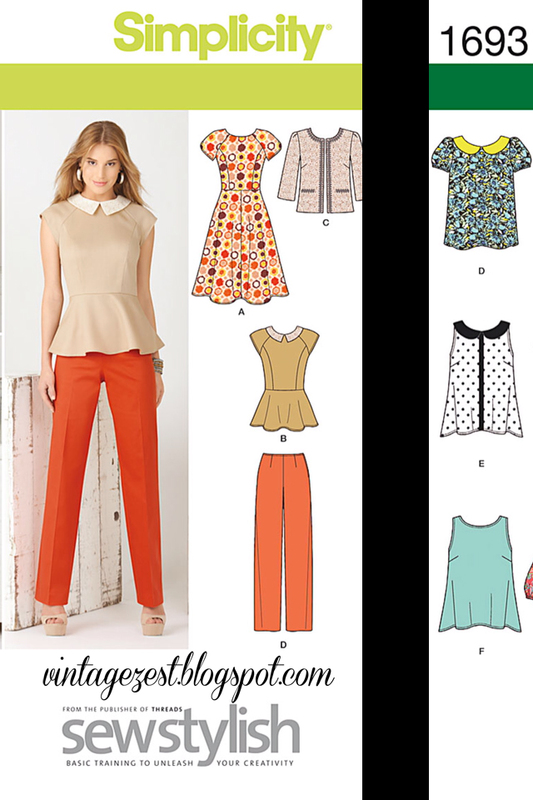 You may have to take a picture for rare, vintage patterns. 2. Click on the picture you want to save. 3. Press down on the picture until this menu pops up. Hit Save Image. 4. 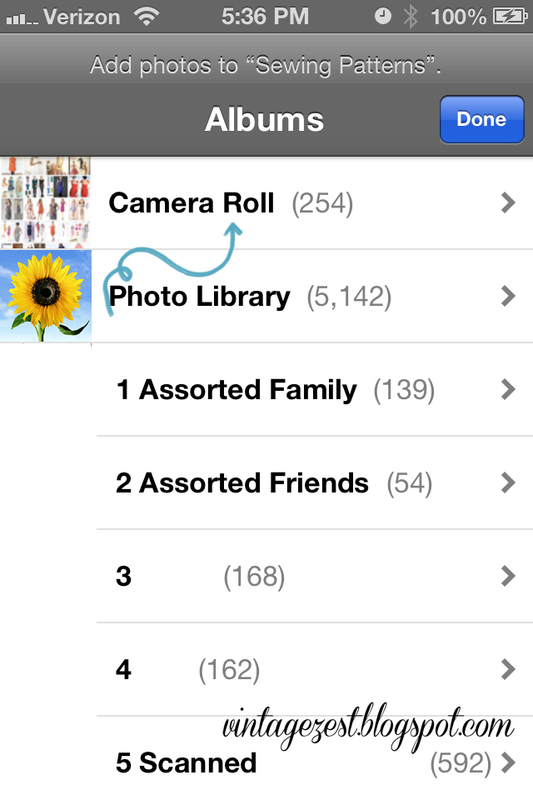 Create an album in your photo album by following steps 9 & 10 above. Hit the Edit button if you want to add more photos. 5. Hit the Add button below. 6. 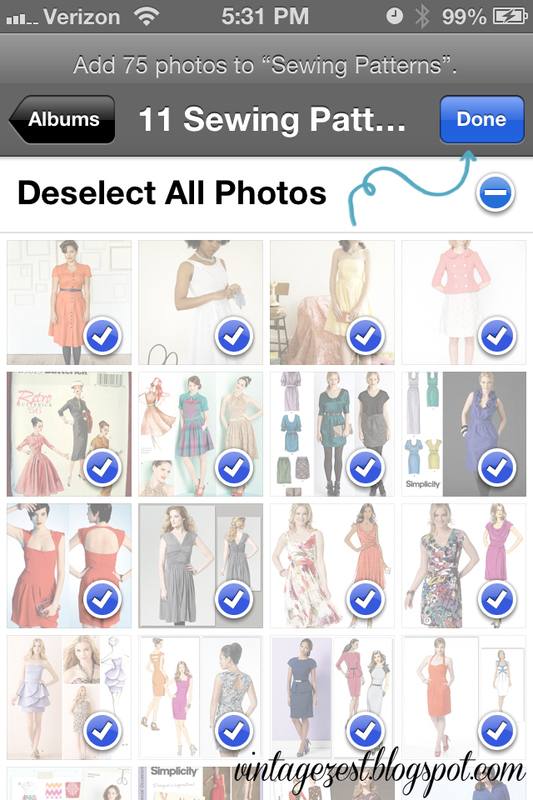 Select the Camera Roll to find the picture you just saved. 7. 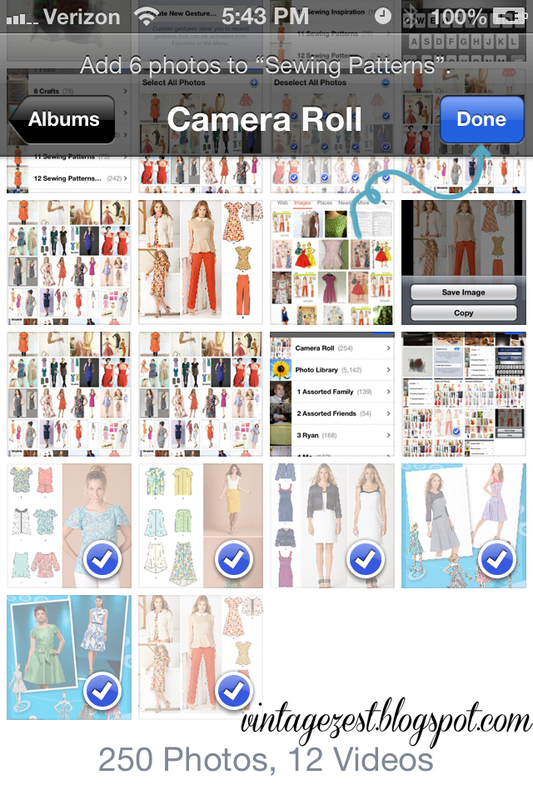 Click on each photo you want to save, then hit Done. 8. 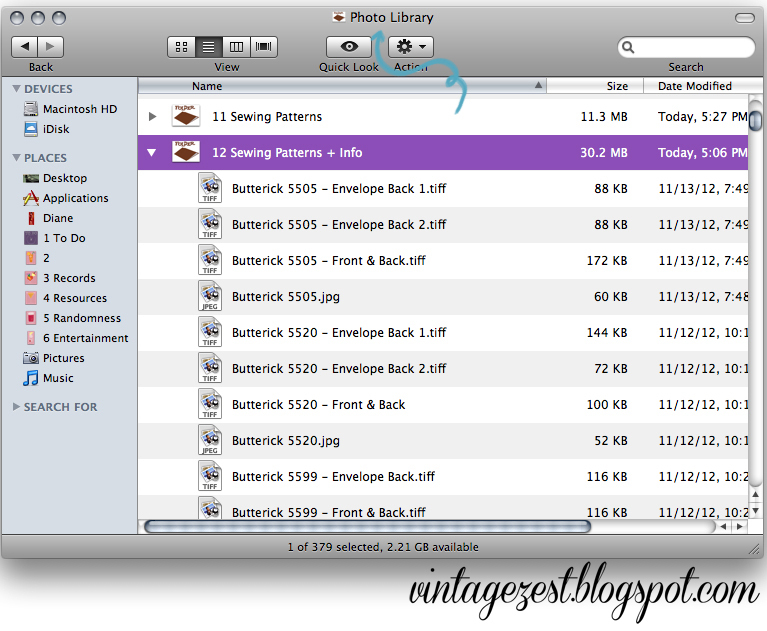 You can choose to organize the photos using steps 14 & 15 above. 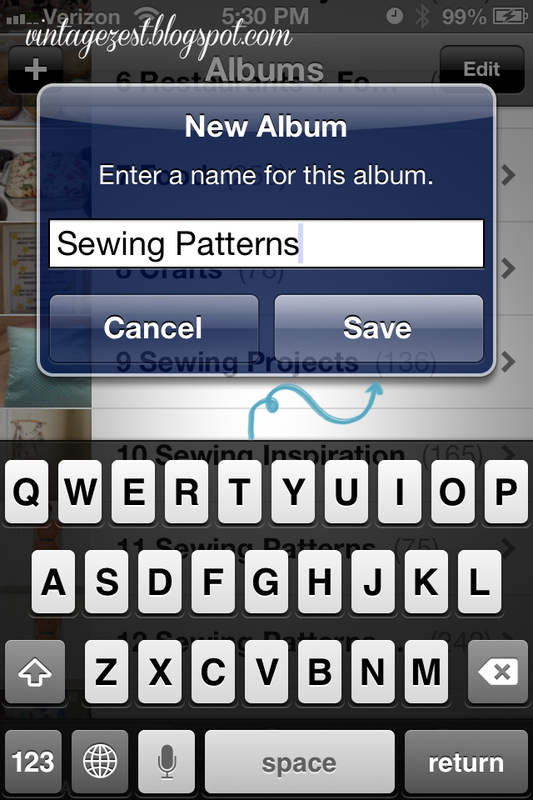 Now, you can scroll through your patterns when you are out, quickly & easily! 1. Go to Printsew.com on either your phone or computer. 2. Search for your pattern and number. 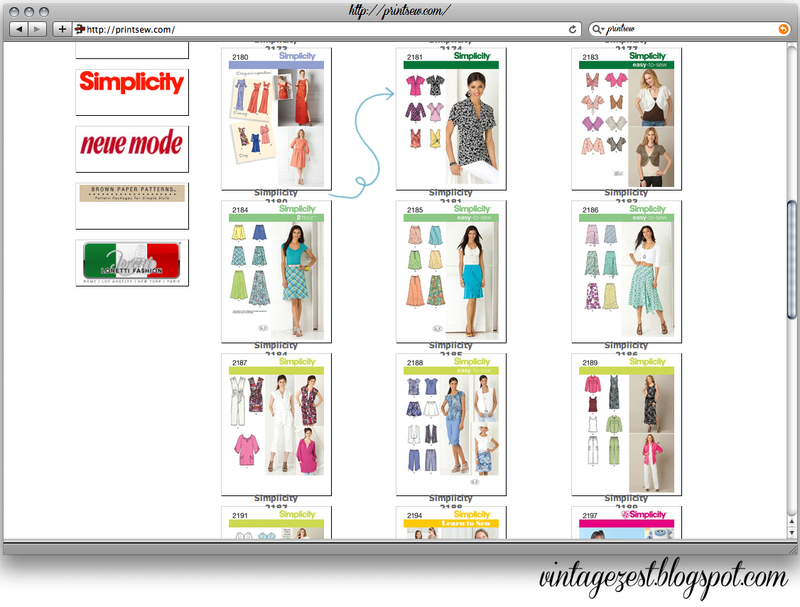 Click on the pattern you want to download. 3. Click on Instructions (even the arrow is pointed to another item). 4. If using your computer, save the PDF in a folder to be synced to your phone, similar to the steps above. 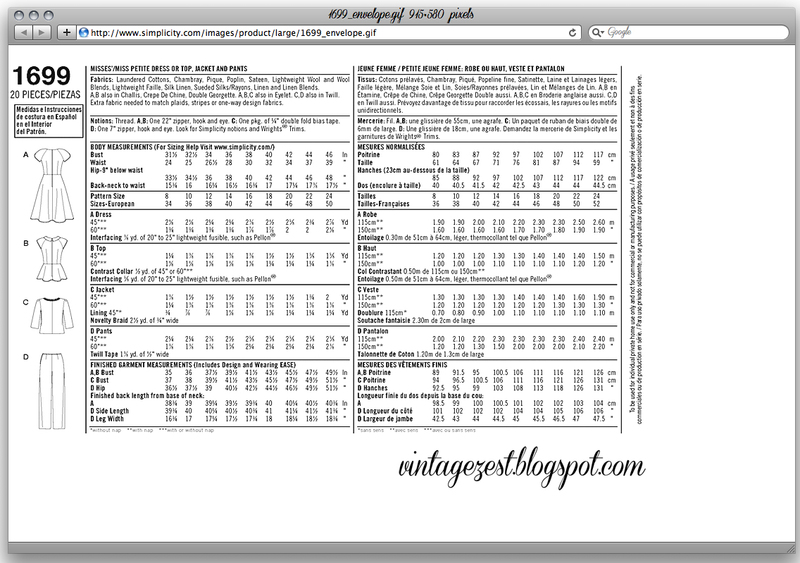 If using your phone, save to the PDF reader of your choose. What do you do when you're out on the town and you are buying sewing supplies without your pattern information? Thank you so much for this!!!! 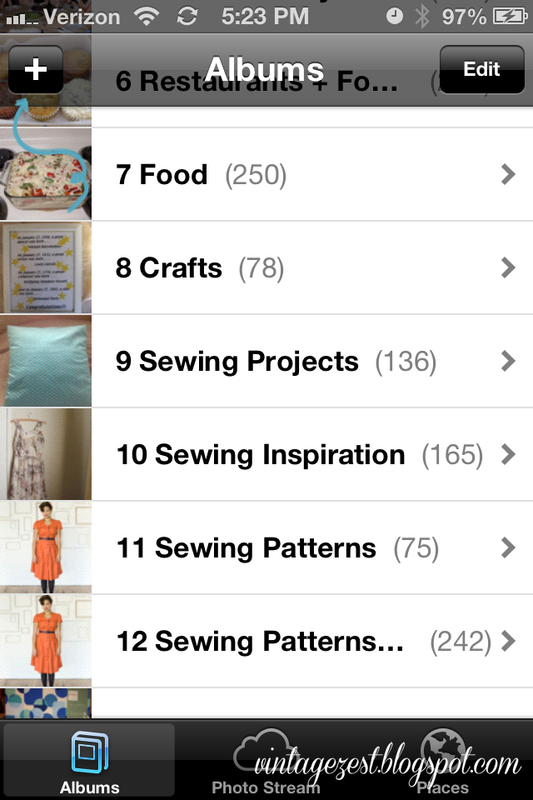 I just got an iphone and def need to organize my patterns. I am marking this for future reference, thanks again! I love patterns. Thanks so much for sharing with Adorned From Above's Blog Hop 55. We can't wait to see what you have for us this week. This weeks party is live. amazing!!! This is such a detailed and well thought out tutorial! Thank you so much for sharing with Give Me the Goods Monday Link Party! You're da bomb! I've been wanting to know how to do this forever. So cool. Thanks loads! Definitely a good option for some, but I'm cheap and this is completely free!